Acanthus Dining Table. Custom furniture. Roman furniture. The Acanthus Dining Table Base was inspired by architectural elements of ancient Rome where the acanthus ornament appears extensively in the capitals of the Corinthian order. Constructed of robust bonded wood and metal, the two pedestals are capable of supporting very large table tops without shaking. Top options include glass, copper, brass, or wood parquetry, up to 120″ wide. 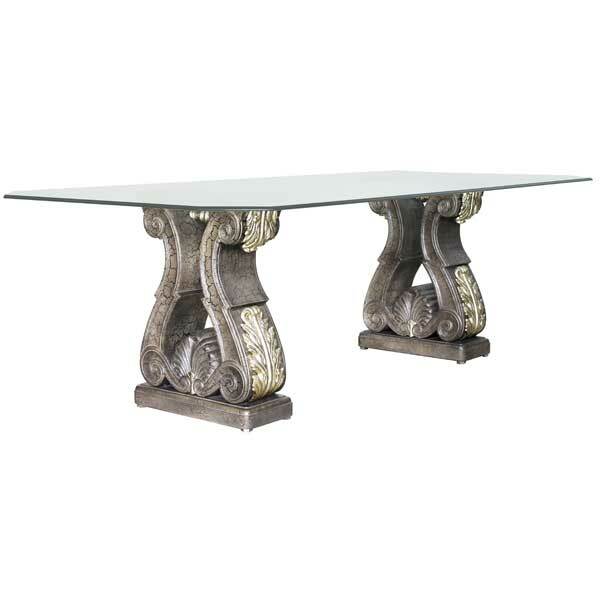 With its casual elegance, it makes an exceptional dining table for upscale residential and hospitality interiors. Each pedestal is equipped with four bronze glides which also serve as levelers – a useful feature when the floor is uneven. Offered in a variety of finishes and accents, the Acanthus Dining Table Base was designed by Shah Gilani, ASFD. Custom sizing is available.